EElmo Lovano is a professional drummer, musical director, producer and founder of Jammcard, the invite-only music professionals network. Dubbed a “LinkedIn for musicians” by Forbes, Jammcard is currently available in Los Angeles, Nashville and Atlanta. Even if you don’t have an account on the platform, there is a lot to learn from the educational content Elmo has been putting out on Jammcard. He interviews some of the world’s most successful freelance musicians for backstage stories, gear insights, and the nitty-gritty of how they’ve landed their dream gigs. 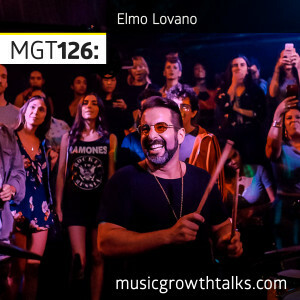 On this Music Growth Talks episode, Elmo talked about the different ways you can prepare yourself for being hired, networking in the physical and digital worlds, and how they merge the two at Jammcard. Listen to the episode in full to learn how to improve your social media game, and how to master a working musician’s “funnel”: from being discovered to closing a deal.